The Boulder City Council, during a special meeting on May 25, instructed the City’s planning staff to study two proposals for development in the North Boulder Planning Reserve. The reserve is a large generally undeveloped tract east of US-36 and north of Jay Road. In the Boulder Valley Comprehensive Plan, development is not allowed in the Planning Reserve for 15 years unless it offers a special “community benefit” and cannot be located elsewhere in the city. 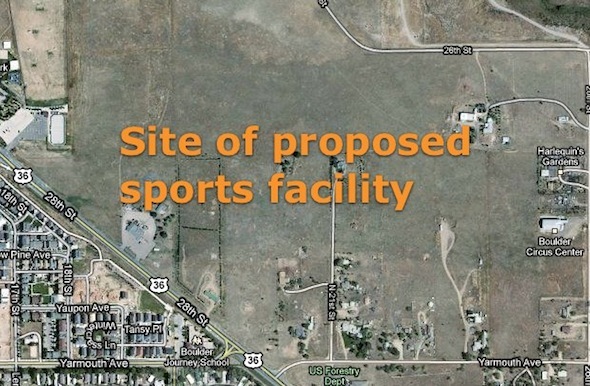 The Boulder Multi-Sport Training Complex, a 61-acre project that would include training facilities for professional and amateur athletes, such as a cycling track, swimming pools, running track and associated buildings. The sponsor estimated that as many as a thousand people could use the facility daily. A 23-acre “agriburbia” residential project by Palmos Development and Thistle Community Housing, blending residential units with gardens for local agriculture. Depending on the final submitted site plan, the project could contain as many as 300 units. Sponsors of neither project provided any design or financing details to Council members. On a motion by Macon Cowles, Council members voted unanimously (with Mayor Susan Osborne absent on City business in Europe) to obtain additional information and bring recommendations back to Council. The Palmos property was the site of a highly controversial development attempt during the 2005 update of the Comprehensive Plan. A proposed “big box” shopping center and adjacent multi-family housing was suggested for the site, and the City Council in office at that time “held open” the Comprehensive Plan beyond its closing date in order to allow the developer to attract an anchor tenant such as Wal-Mart or Costco. That questionable decision was quickly reversed by a new City Council majority seated in 2007. In addition to the Planning Reserve proposals, Council considered a number of smaller and generally less controversial changes to the Comprehensive Plan’s land use map. Council also approved initially the planning staff’s recommendations for other aspects of the update, including sustainability policy and the community’s urban form and design features. The process of amending and updating the Comprehensive Plan will continue through the summer before final approvals by the Boulder City Council, Boulder County Commissioners, City of Boulder Planning Board and Boulder County Planning Commission. Members of the public will have opportunities to speak on changes at public meetings and public hearings. For additional information on the Boulder Valley Comprehensive Plan update, visit this site.